I’m just a photographer. I know I’m not saving the world, but I always hope my art can make someone’s life better. Whether that’s through something as simple as creating art or making one’s wedding day better. Rarely, however, are their tangible means to link directly with your work, so today is a rare occasion. 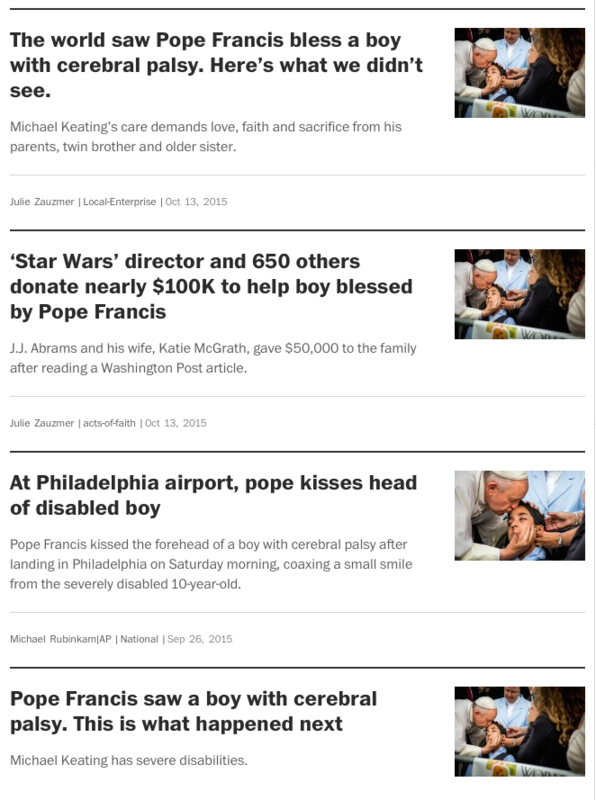 Much has happened since I captured a moment of Pope Francis blessing a disabled child, Michael Keating, with a kiss at the beginning of the Papal visit to Philadelphia at the Atlantic Aviation tarmac (photo). Since then, that photo has gone viral, appearing on thousands news outlets, and gaining awareness beyond what everyone saw on the TV cameras. The Washington Post contacted the Keating family and spent four days with them, sending both their own reporter, Julie Zauzmer, and photojournalist, Ricky Carioti. Ricky did a fantastic job, documenting the much harder daily life of the family. 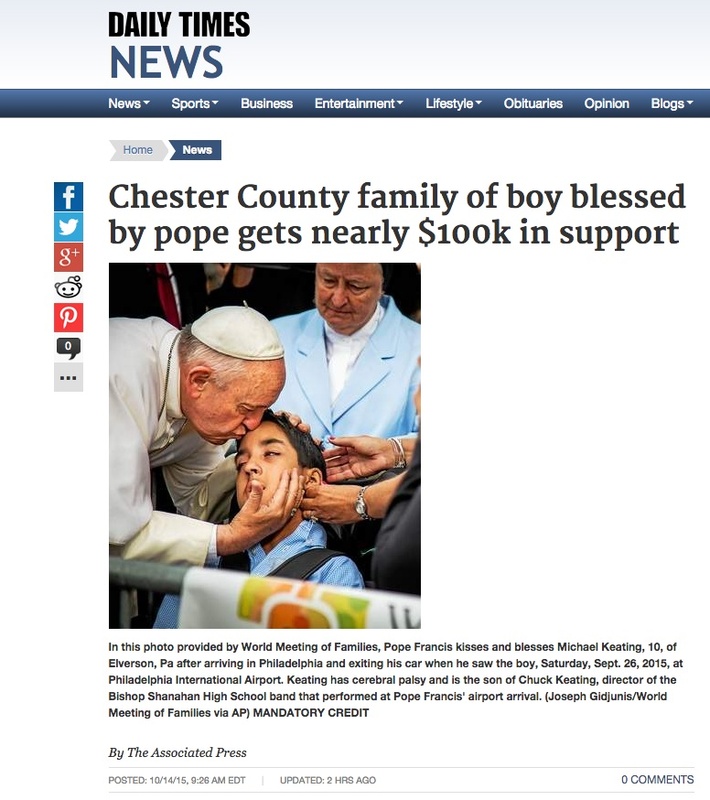 To my surprise, however, when it was time to run a single banner photo to entice readers to the story, the Post continuously ran the initial moment at the airport. I feel incredibly honored to be even slightly connected to the Keating family. They truly are an inspiration for so many families across the country. (Read their whole story here.) 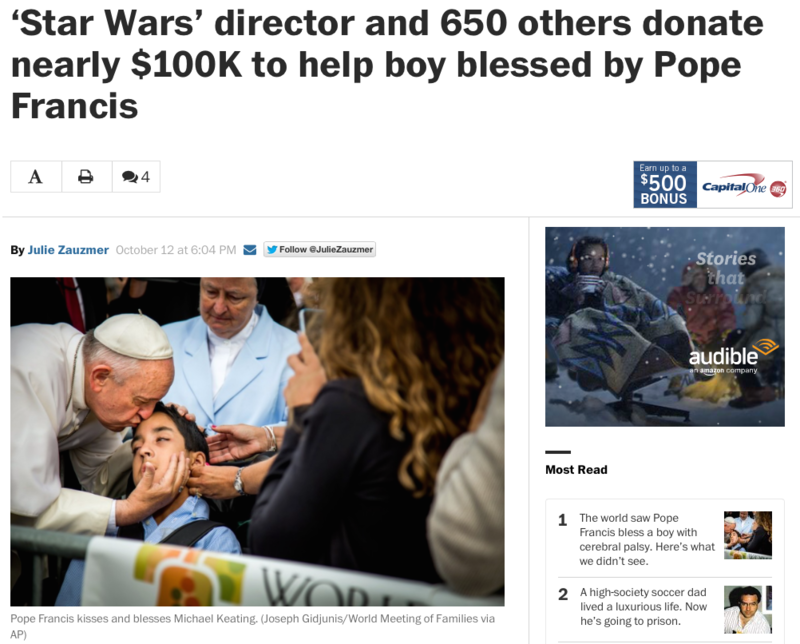 What’s amazing is that this attention from The Washington Post has instigated an online funding campaign which at last check, was more than $120,000 strong. The funds will go towards making updates to their home and transportation, to make it easier for Michael to get around. I had the pleasure of speaking to Kristin on Tuesday, the Keating matriarch of Michael, Chris and Katie. We talked about the experience as a whole, and how they feel very lucky and have been moved by the number of families like them offering support. Kristin said the family didn’t need anything specific now, but would love several prints of the photos I got that life-changing morning. So expect a large canvas in the mail soon, guys! And maybe their daughter Katie will take me up on those photography lessons someday. 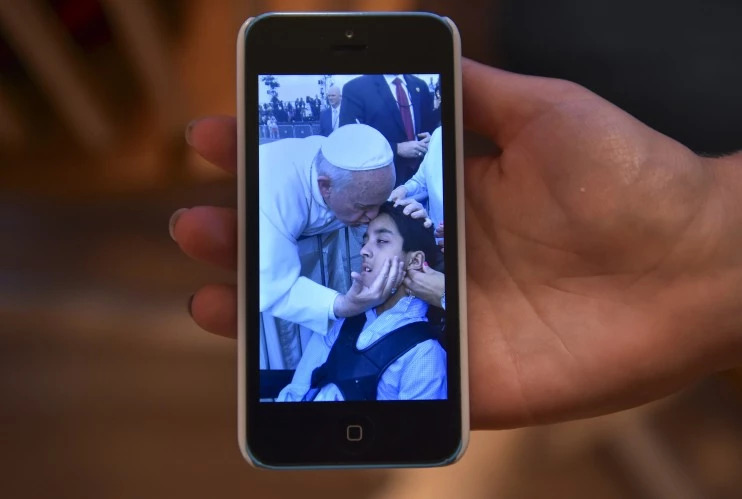 That morning before the Holy Father arrived, I gave her a quick tutorial, and maybe it worked because she took an awesome shot of Michael’s moment with Pope Francis on her phone, too! See below. We were showed the articles below by one of our contacts at the Associated Press, who raved about the impact that photography can have in our image-saturated digital age. This truly is an amazing moment, but I certainly hope it’s not my last.